Look the form team of the competition after their demolition of Brisbane on Wednesday night. A win against either of the Melbourne Stars or Hobart will wrap up a finals spot, but they’ll be pushing to win both in a bid to secure a home final. 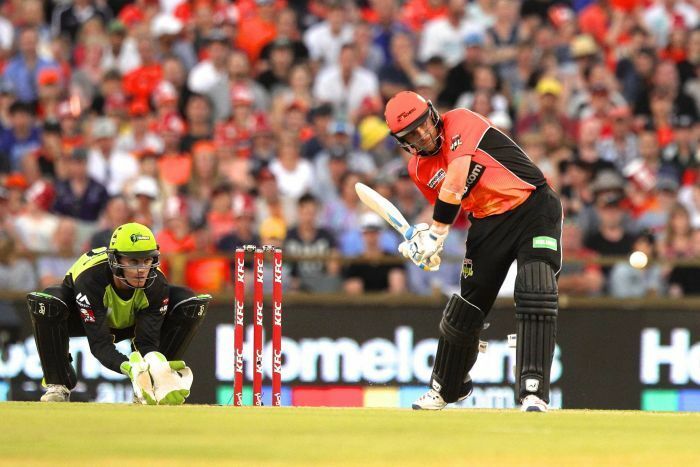 Near-certainties to make the finals a week ago, the Heat looked a different team without Chris Lynn in their loss to the Scorchers. Still need another win against either of the two Melbourne sides they still have to play, but could also be without captain Brendon McCullum against the Stars due to slow over- rates. A win in either of their last two matches against the Thunder or Stars will be enough to ensure a finals appearance. But their net run-rate isn’t good enough to get them through should they lose their last two games. Should they both stutter, the last round clash against the Stars could be make-or-break for both teams. Have the toughest run home of all teams, and will be the franchise those below them are eyeing off as their chance to leapfrog. One win against fellow top-four sides in Perth, Brisbane and the Sydney Sixers should be enough to get them through given they have the best net run-rate in the competition, however they would want to take victory in two to certify their sixth straight finals series. Need to win all of their last three to be certain of a spot in the finals, but two will be enough if results fall in their favour. Can virtually knock those below them out of contention when they take on Hobart and Adelaide in their next two games. Have a game in hand on three of the top four above them. Started the season with so much promise, but now need virtually everything to fall in their favour after Tuesday’s tight loss to the Stars. Have two winnable games against the Renegades and Thunder remaining, but will have to rely on the Stars dropping at least two of their remaining matches to have any chance. Things haven’t gone to plan for the Hurricanes in BBL06, but they still remain a scant chance of reaching the finals with a number of teams taking victories off each other. Would consider themselves a shot at upsetting the Renegades at Etihad on Thursday night, but then would still have to beat the Scorchers in the final round to have any chance of making the finals. Also relying on the Stars to drop at least two matches. Somehow still remain a remote chance of defending their title despite dropping their first four games. Making the finals would require them to not only defeat the Sixers and Strikers, but do so comprehensively to overturn the worst net run-rate in the competition. Would also need the teams immediately above them to take games off each other and have the Stars struggle against the top three sides.